Baxter and Boone were among the top 14 counties reporting influenza cases for the week ending Saturday. 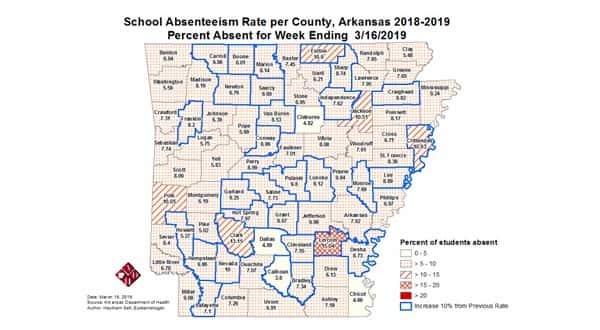 The weekly report from the Arkansas Department of Health also indicates the public school absenteeism rate in Baxter and all surrounding counties increased over the previous week. While Baxter's school absenteeism rate increased, it was below the state average of 7.8 percent at 7.45 percent. During the flu season, the Arkansas Department of Health produces a Weekly Influenza Report for clinicians. The report provides information on flu activity in the state. Fulton County had the highest public school absenteeism rate in North Central Arkansas at 10.9 percent, followed by Searcy County at 9.69 percent, Marion County at 8.14 percent, Stone County at 6.95 percent, Newton County at 6.76 percent and Izard County at 6.21 percent. As of Saturday, the Arkansas Department of Health was aware of 26 schools having closed briefly due to the flu during this season. Among flu antigen tests that can distinguish between influenza A and B virus types, 94 percent were influenza A, and 6 percent were influenza B. To date, 77 influenza-related deaths have been reported in Arkansas this flu season, including one pediatric death; 71 percent of the adults were not vaccinated or had an unknown vaccine history.